iWave has announced a System-On-Module (SOM) based on Renesas RZ/G1M embedded processr. RZ/G1M SOM is Qseven R2.0 compatible industrial grade CPU module. Called the iW-RainboW-G20M, this SOM module supports 1 GB DDR3 RAM, 4 GB eMMC Flash and 2 MB SPI NOR Flash. Expandable memory is optional. The module also includes on SOM Gigabit Ethernet PHY, Micro SD slot and USB HUB. Renesas’s RZG1M processor supports dual cortex A15 core operating at 1.5 GHz core and includes 64-bit DDR3 interface at 800 MHz. These features provide higher performance for applications such as image processing of multiple video streams and video sensing. The high-speed on-chip integrated USB 3.0, PCIe, Gbit Ethernet and SATA peripherals allows easy expansion of functionality without the need for external components. The RZ/G1M processor supports full HD hardware encode and decode processing up to 1,080 at 60 frames/s, dual display and three channel video input ports. The built-in PowerVR SGX544MP2 Graphics core at 520 MHz allows the user to develop highly effective user interfaces. The RZ/G1M SOM is supported Linux 3.10 LTSI with Android BSP support to come. To enable quick prototyping of RZG1M SOM, iWave systems supports RZ/G1M development kit with comprehensive peripheral support. This will help customers to save up to 60% of new product development cycle using the RZ-G1M MPU. 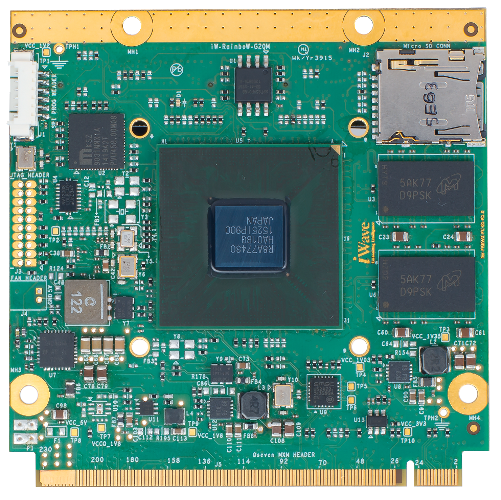 This entry was posted in CC Blog, Industry & Enterprise, Product News and tagged embedded boards, eMMC, flash, Gbit Ethernet Micro SD, Qseven, Renesas RZ/G1M, SBC, SOM, system on module, USB HUB by Circuit Cellar Staff.